Join us for a Regional Agri-tourism workshop, including a farm tour and informational presentations. Who should attend? Farmers considering or already pursuing agri-tourism, policy-makers, and consumers interested in learning about agri-tourism. 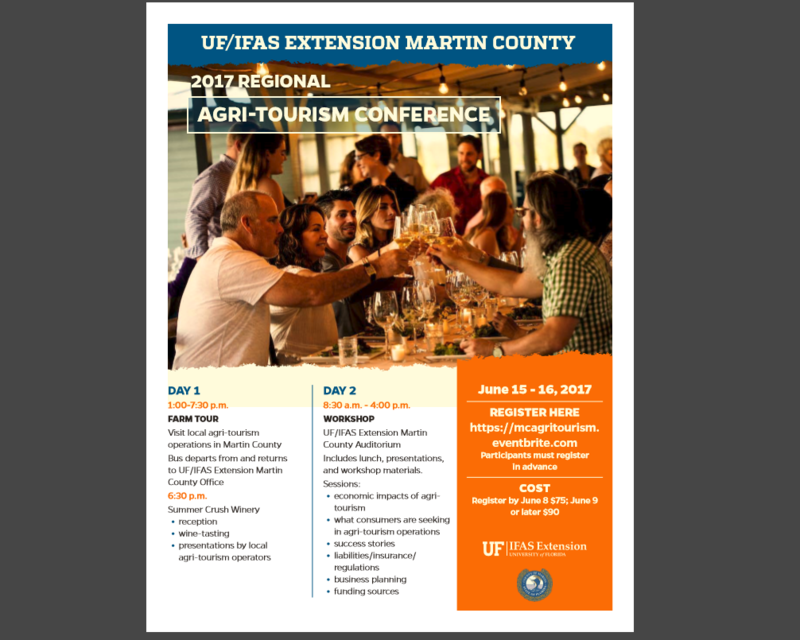 Thursday, June 15 – Farm Tour via bus departing from and returning to UF/IFAS Extension Martin County, 1-7:30 pm. We will visit agri-tourism operations in Martin and St. Lucie Counties and hear directly from the farmers about their challenges and successes. The tour will include a reception and wine tasting at Summer Crush Winery in St. Lucie County, with presentations by local agri-tourism operators and an opportunity for discussion. Refreshments will be provided. Friday, June 16 – Workshop, 8:30 til 4:00, UF/IFAS Extension Martin County Auditorium. Presentations will be offered to assist new and existing agri-tourism operations with navigating regulations, business planning, marketing your agri-business, awareness of consumer preferences, and resources available to fund your operation. We will also have a panel discussion focused on regulations and insurance needs specific to agri-tourism businesses. A catered luncheon and refreshments will be provided.